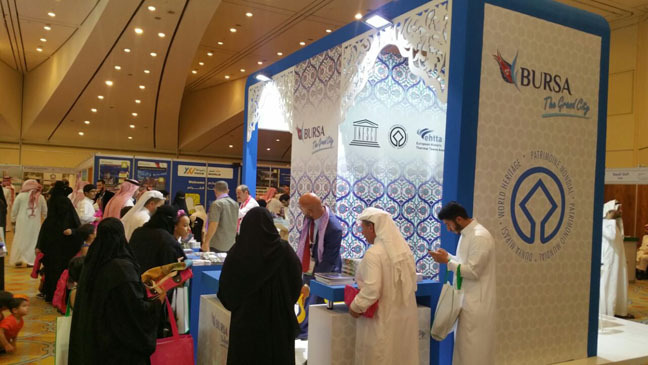 Bursa attracted great interest this year as it was last year in the International Riyadh Travel Fair, which was held in Riyadh / Saudi Arabia since 2009. Riyadh Travel Fair was held on 7-10 April 2017, where 250 institutions from 50 countries and hosted more than 30 thousand visits. The fair was inaugurated by His Excellency Mr. Majid A. Al-Hokair, Chairman of the Committee for Tourism and Entertainment Riyadh Chamber of Commerce and Chairman of Board Directors for Riyadh International Conference and Exhibition Center. The investment environment and tourism values were introduced together in the exhibition where Bursa participated with an independent stand. Bursa stand specially designed to present historical and natural beauties of UNESCO city Bursa together with its thermal resources and Iznik tiles has taken full marks from the visitors. Director of Bursa Culture Tourism Promotion Association and member tourism agencies participated to the fair as exhibitors. With Bursa Governorship’s lead and Bursa Eskişehir Bilecik Development Agency (BEBKA) and Bursa Culture and Tourism Promotion Association’s mutual organization, Bursa participated to the exhibition. In first day of the event, Majid A. Al-Hokair (Chairman of the Committee for Tourism and Entertainment Riyadh Chamber), Riyadh Culture and Promotion Consultancy, and Bander AL-GRYNI (Riyadh Travel Fair Organizer) visited the Bursa stand. Leaflets and brochures in English and Arabic, as well as promotional materials were distributed to the visitors during Exhibition which has been organized 9 times including this year.